The Winter 2011 issue of HB magazine has been recognized and honored with three awards in recent months, from the American Advertising Federation, the Press Club of Cleveland, and CASE - the Council for Advancement and Support of Education. In the international CASE Circle of Excellence awards, HB Editor Kathleen Osborne received a Bronze Award in the category of Independent Schools: Best Articles of the Year for the magazine's cover story, "Rising Boldly," which relays the inspiring stories of resilience shared by five remarkable HB women. In statewide competition, in the category of Single Illustration - All Other Publications, HB Visual Arts Department Chair Jamie Morse earned Second Place honors in the Excellence in Journalism awards program sponsored by the Press Club of Cleveland. He was recognized for his original painting that accompanied the cover package. And in the regional Addy awards sponsored by AAF Cleveland, the HB editorial team, under the guidance of Creative Director Vanessa Butler, was given a Bronze Addy for Collateral Material - Magazine Design. Hathaway Brown was one of two independent schools to receive Best Articles of the Year honors this year. According to the organization's website, in 2012, CASE received more than 2,800 entries for consideration in 40 categories by 567 member higher education institutions, independent schools and nonprofits from around the world. Judges gave 275 bronze, silver and gold awards. Only 19 of those awards were given to independent schools across the globe. Additionally, HB was the only high school alumni journal to receive an Excellence in Journalism award, and ours is the only in-house marketing department to receive an Addy award for a school publication this year. HB magazine is published twice annually, with Summer and Winter issues distributed to 8,000 alumnae, parents, faculty and staff, and friends of the school. The magazine aims to keep members of the Hathaway Brown community connected with the institution and with each other. It is designed to inform, enlighten, and entertain its diverse readership. 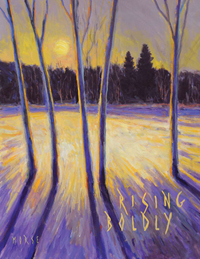 To read "Rising Boldly" and browse the HB magazine archives, please visit www.hb.edu/magazine.